Anointing of David by Samuel (circa 1328-1340). Psalter of Queen Philippa. English. The British Library, London. Public Domain. Finally, all the tribes and elders came to David and told him they wanted him as king. 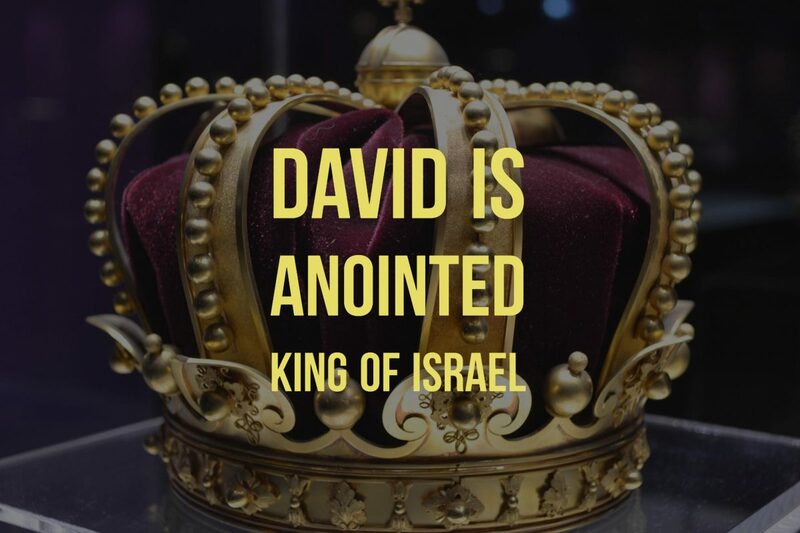 David was anointed king over all of Israel at age 30. He reigned in Hebron 7 1/2 years and in Jerusalem 33 years. 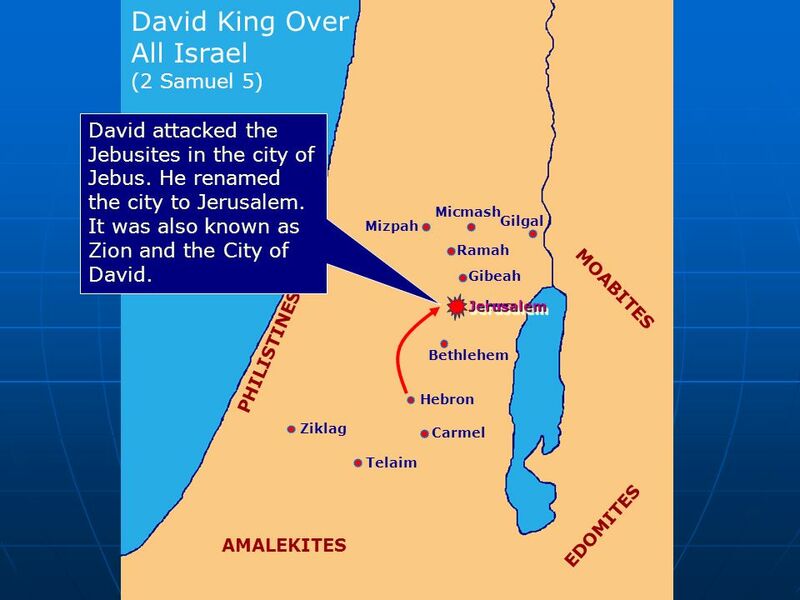 David captured Jerusalem (otherwise known as Zion) for his capital, a city about in the middle of the northern and southern part of Israel. David built a palace, and he grew stronger as the Lord was with him. He took more wives and concubines and had more kids. 3) “We are your own flesh and blood. In the past, while Saul was king over us, you were the one who led Israel on their military campaigns. And the Lord said to you, ‘You will shepherd my people Israel, and you will become their ruler. '” God had him anointed and in His timing, David became king. 4) Part personal Question. My answer: Patience as he waited for the people and the elders to come to him. Faithfulness as David trusted in God’s promise to make the kingship happen, so David never took matters into his own hands. Lots if I’d listen. Patience with my kids and my career and what’s next in my life. 5) Part personal Question. My answer: David knew he was successful because the Lord was with him. David knew the Lord had established him as king over Israel and had exalted his kingdom for the sake of his people Israel. David knew it was all about God’s glory. God has put me in my job and in my family and everywhere I go to bless others around me. Finally, after all those years of patiently waiting and hiding, David becomes king. I picture him as content in God’s plan as he continues to follow it through. He understands it is all about God, and he is merely being used by God. And yet we see his imperfections in wives and such. We are all human, making mistakes, and striving to do what’s best. Prior to this, only one of the tribes of Israel recognized David as king. The other tribes recognized Ishbosheth, a son of Saul. The tribes only turned to David when their previous choice was taken away. Why did the elders recognize David as king? 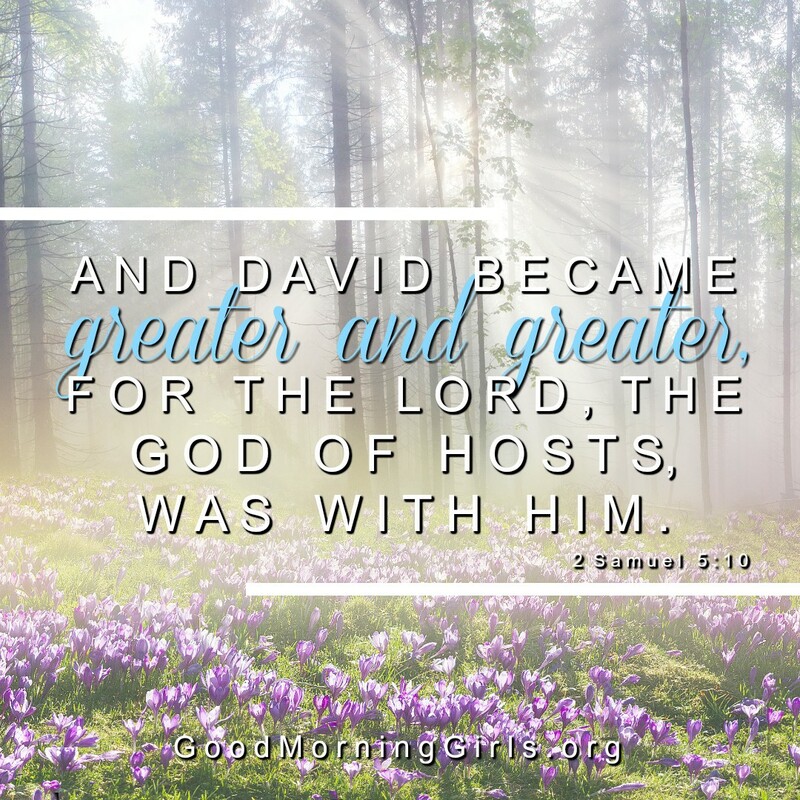 David was God’s anointed one. 1 Chronicles 12:23-40 describes the great assembly that gathered in Hebron to recognize David as king over all Israel. Chronicles describes the impressive army that came to Hebron and numbers the soldiers at over 340,000 men. It then describes the scene: All these men of war, who could keep ranks, came to Hebron with a loyal heart, to make David king over all Israel; and all the rest of Israel were of one mind to make David king. And they were there with David three days, eating and drinking, for their brethren had prepared for them… for there was joy in Israel. Samuel anointed David when he was about 15, and he did not take the throne until 30. David spent at least 15 years in preparation for the throne of Israel. Up to this time Jerusalem was a small Canaanite city in the center of Israel. Some 400 years after God commanded Israel to take the whole land, this city was still in Canaanite hands. Because of its location, Jerusalem was an easily defended city. This made the Jebusites overconfident and quick to mock David and his troops. Why pick Jerusalem as Israel’s capital city? It had no prior tribal association and was therefore good for a unified Israel. The geography of the city made it easy to defend against a hostile army. It was centrally located between the north and south of Israel, belonging to neither. In God’s plan there is almost always a hidden price of greatness. Often those who become great among God’s people experience much pain and difficulty in God’s training process. Neighboring kings honored David with the finest craftsmen and wood to build a palace. The relationship with Hiram king of Tyre also showed that David was more than a man of war: David knew how to build important political alliances. What Godly qualities did King David know? David knew it was God who called him and established him as king — not man. David knew Israel (his kingdom) belonged to God. David knew he was king for the people of Israel’s sake and for God’s sake. Being king had nothing to do with him. David knew he and Israel flourished because of God and no one else. Having multiple wives was in direct disobedience to Deuteronomy 17:17: Neither shall he multiply wives for himself, lest his heart turn away. Certainly David (and everyone else) saw these many children as God’s sign of blessing upon David and his many marriages. Yet most of the trouble to come in David’s life came from his relationships with women and problems with his children. It is often true that the seeds to our future trouble are sown in times of great success and prosperity. In some ways, David handled trials better than success.